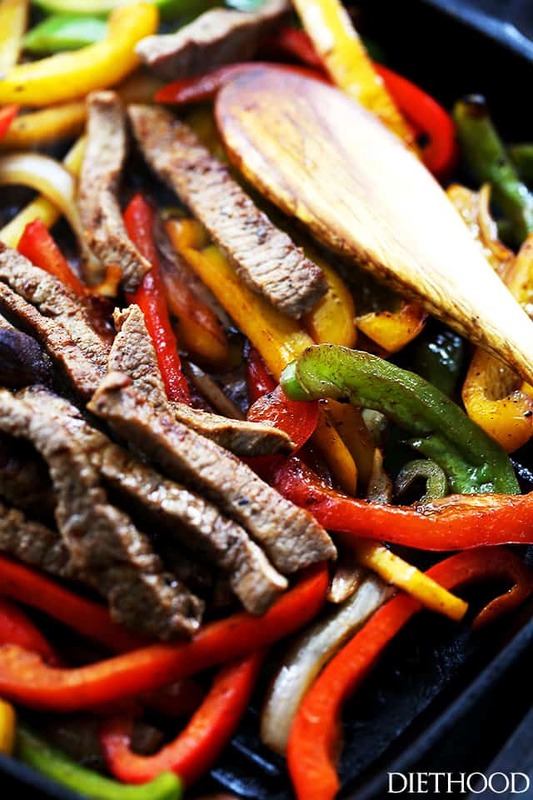 Steak Fajitas – Perfectly seasoned, classic steak fajitas with onions and peppers, wrapped in warm flour tortillas. Juicy, flavor packed steak fajitas make an irresistible and easy option for a quick weeknight dinner, or a celebratory weekend! I could eat every.thing that is on that plate. And I have. Steak fajitas are fantastic! Also? Don’t hate on my overly well done steak. In this house, THAT is how we do beef. No pink/red stuff, or we’d all go the vegan-route. You guys, you guys, you guys. How is it Sunday, already?! Sunday comes so dang fast. And this was one eventful week – I could’ve used a few hours OFF. 1. Had dental work done – I’m still in pain, and I’m gargling salt water like every 3 hours. TMI? 2. Found out our neighbors had a Meth Lab!!! in their garage … wth? Always question someone when they go from a 1999 Buick-something to a 2016 Mercedes AMG. Just sayin’. See! I might need a vacay. Now that you’re all caught up with my life, we can go ahead and discuss our Steak Fajitas dinner. When I get a craving for steak fajitas, I can’t get rid of the craving until I eat them. And if that involves Chili’s, the ristorante, so be it. ( I kinda loooove their food! ) But it shouldn’t involve any restaurant because fajitas are one of the quickest meals to make. Chopping up the veggies and cutting up the steak takes longer than the actual cooking-time. 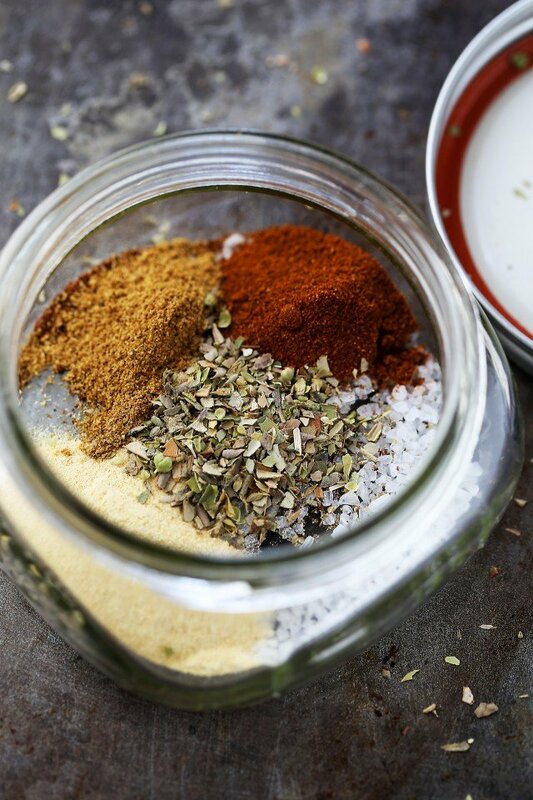 Truth be told, I was actually prepping some spices, including a Homemade Fajitas Seasoning Mix that the hubs and I absolutely love love love, and how can you prepare the seasoning and not make da fajitas? You just can’t! Heat olive oil in cast iron skillet, then add bell peppers and onions with our fajitas seasoning mix; cook until tender. Add sliced steak to the skillet; season and cook for 3 to 4 minutes, or to a desired doneness. Stir in the previously prepared veggies and continue to cook for about 2 minutes. Spoon prepared veggies and steak on warm whole wheat tortillas. Top with cheese, sour cream and guacamole. 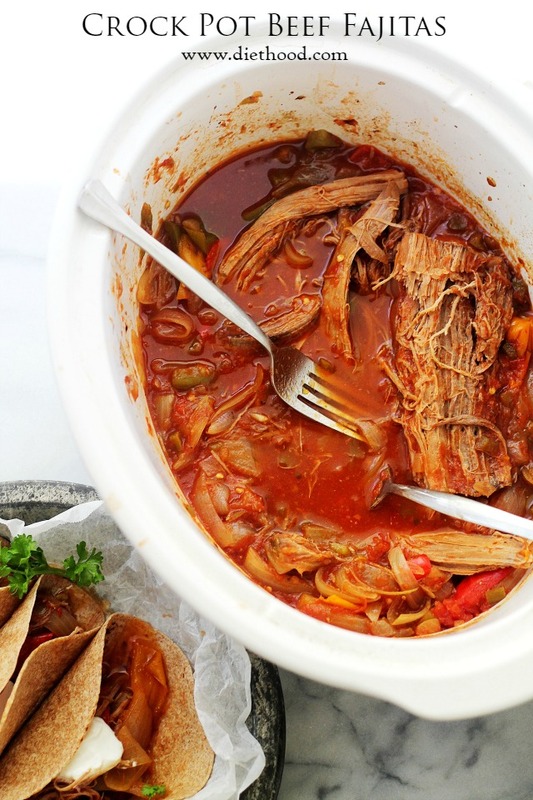 You should make these fajitas because they are delightful and beefy. And are loaded with peppers, and also have this nice crunch factor. And when you eat them, it’s like you’re eating restaurant food, but it’s not restaurant food! Okay. Put this on your week’s rotation and let me know if you loved it, m’kay? I bet the Seasoning is going to win you over! 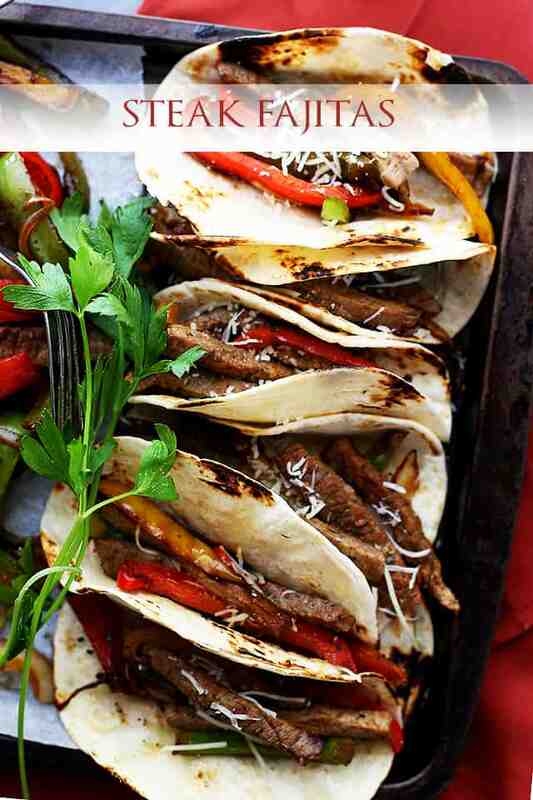 Perfectly seasoned, classic steak fajitas with onions and peppers, wrapped in warm flour tortillas. Heat olive oil in a large skillet (I always use my cast iron skillet for this) over medium-high heat. Add bell peppers and onion; season with 1-1/2 tablespoons of the fajitas seasoning mix and cook for 5 to 6 minutes, or until tender, stirring frequently. Transfer vegetable mixture to a plate and set aside. Add the sliced steak to the skillet; season with 1-1/2 tablespoons of the fajitas seasoning mix and cook for 3 to 4 minutes, or to a desired doneness. Stir in the previously prepared veggies; continue to cook for about 2 minutes, or until everything is heated through. These came out great. I did chicken instead of beef and for the fajitas seasoning I used 1/4 tsp of chili. Will be making again. Thanks so much for sharing. Looks Lucious! Can’t wait to try it! Thank you! Just when you think you know someone, you find out their meth manufacturers–oy! Imma need all the fajitas you got, m’kay? YUM GIRL!!! It doesn’t get better than these fajitas. My kids would go crazy for these! Guess what is going on the dinner menu?! And holy cow…a meth lab?! Now that is a little scary! Wow, that is some week! I hope you recover soon from the dental work so you can make this again and take a bite! Hope your little one gets better soon! Love these fajitas, Kate! I’m with you! I love well done steak! These look amazing! And, by the way, a meth lab!? Holy cow–craziness! 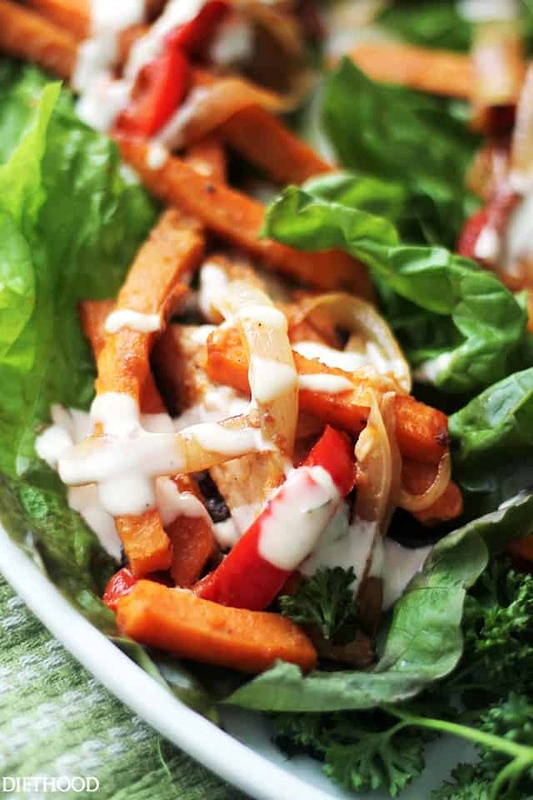 There is never a time that fajitas don’t sound lovely!! These are picture perfect! 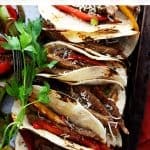 I love fajitas, what a great recipe! Totally going to make this one soon. And yes, you deserve a vacation. Meth lab? For real? Crazy! “Don’t hate on my overly well done steak. In this house, THAT is how we do beef. ” Not even kidding, my mum wanted to disown me when I once ordered steak medium-well done. she thought i’d die. 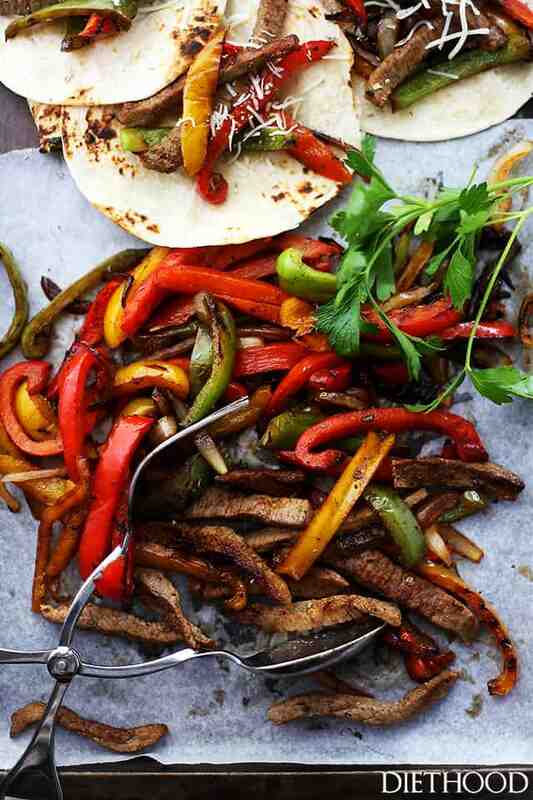 You definitely need a vacay after all that, or well…these fajitas. A good compromise? LOL. I just pinned it and it said someone pinned it into a vegan board. Best. Well, you win for the most interesting week! I kind of have to laugh about the car thing (so shocking that a meth lab was so close!!) Funny you mention the cooked steak. I made beef tenderloin for the first time and did it really medium rare like my husband likes it, but I had to throw some pieces back in the oven for the people who get grossed out! WOW! What a week! Meth lab?! You just never know what’s going on next door do you? Love these delicious fajitas. Perfect for a celebratory dinner!